Although it has been a week since the closing of an exceptional AAL Forum 2018, the energy, the discussions and the friendships will continue to permeate for a lot longer. To help continue these dialogues and collaborations we will be releasing material from the forum over the next few months. 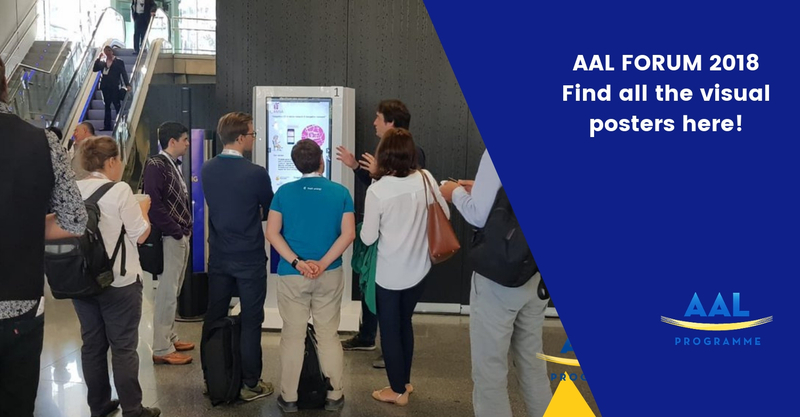 Over the two days of the AAL Forum, 36 posters were publicly presented in the exhibition hall to interested delegates and attracted passers-by. But don’t worry – you haven’t missed out if you didn’t see them! You can find all the visual posters in one easy-to-access place, simply follow this link. This page will be live for six months, providing you ample time to look through the posters at your leisure and read about some of the latest developments, products and services in AAL. If you have the AAL Forum 2018 App or the AAL Programme, you can find a double-page spread on the posters that were presented. If you are interested in any in particular, by following the link above you will be taken to a site that is easy to use and allows you to search by author, name or poster title. You are also free to post your own comments or questions to the authors of the posters, as well as download them using the QR code enabling you to share the poster with your colleagues and contacts. We hope you had a fulfilling and memorable time at the 2018 AAL Forum. Keep your eyes peeled for the AAL Executive Summary!